1. Landowners tell the Fracking Industry and Government about their air, water, and land contamination caused by Fracking. Industry and Government say - "NO PROOF" of contamination from Fracking. 2. Landowners pay for environmental testing and obtain documented proof of fracking contamination. 3. 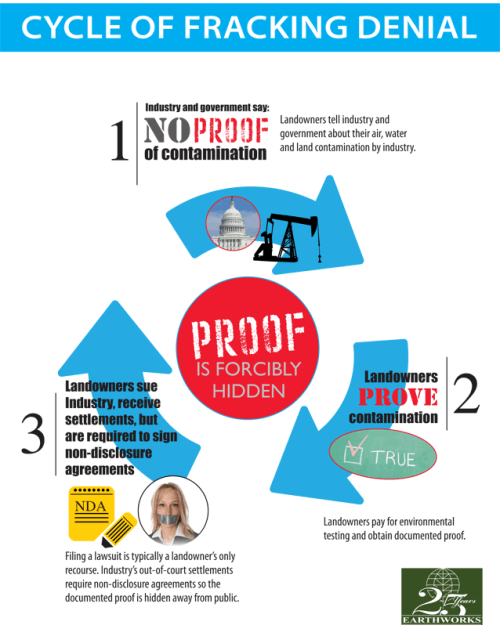 Landowners sue the frackers, receive out-of-court settlements, BUT ARE REQUIRED TO SIGN NON-DISCLOSURE AGREEMENTS so the DOCUMENTED PROOF IS HIDDEN AWAY FROM THE PUBLIC.